A blend of Alternative and traditional country music. The songs on this disk were composed for the play Lust'n Rust, a musical comedy about the loves and heartaches of the residents of the Redbud Mobile Estates. Frank and Dave have been working together for almost a decade on various film projects, usually with Dave writing and Frank directing. In '98, Frank began working with Carol, a film producer, and discovered that she was a like-minded musician. Frank came up with an idea for a country musical that takes place in a trailer park, and the three started writing songs for the play. Mark Braun's pedal steel expertise was added to give the band country credibility and tasty solos. 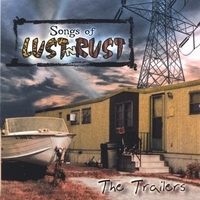 The songs on this disk were composed for the play Lust'n Rust, a musical comedy about the loves and heartaches of the residents of the Redbud Mobile Estates. Most of the citizens of Twister Plaines, Illinois work at the local Agribig plant, including Steve, the new plant manager who has just moved in from the East Coast. What secret is Steve keeping from Connie, the adorable, soon-to-be-divorced waitress at Smitty's Diner, and how will his assignment affect the destiny of the entire town?